The concept of fitting projects into bits of time throughout the day is great. Divided into AM, PM, and Weekend makes sense. The simplicity of the Travel Shawl is appealing. The Leafy Knot Clutch I've seen in ravelry or on some knitters site, and it's got cook construction. Ostrich Plumes Shawl is magnificent but super easy. The Mesh Layering Tank in allhemp is a cool idea. The Lacy Cable Socks have a neat twisted garter heel - smart! All patterns are by the author rather than contributors and that's nice to see. 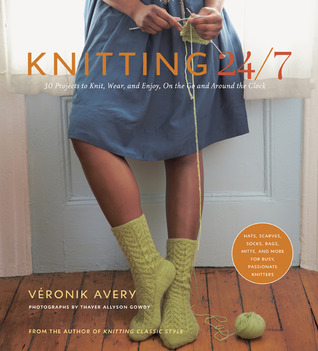 Sign into Goodreads to see if any of your friends have read Knitting 24/7.